Oh, I know, dear reader, what you are thinking at this moment. You are saying to yourself, Can it be true? 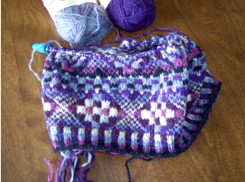 Two blog entries from Pinko Knitter in one day? Be still, my heart! Yes, it’s true. Two posts in one day. This one will be short and sweet, or not.☺ I promised progress reports on my King Harald’s Hat, and since I am progressing quickly, I am reporting daily. Last night I reached about 50% completion. I am getting close to the section where the decreases start. I can’t believe how quickly a Fair Isle hat goes. It looks so complicated what with all the different colors and frequent color changes, but it’s really quick, and rather simple and easy, too. I should have King Harald’s Hat completed in just a couple of days. Then I shall turn my attention to Kinsale. Stay tuned.